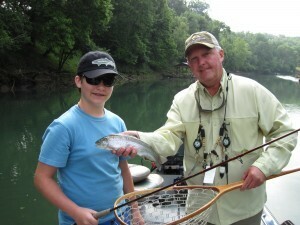 Stuart from Little Rock brought is young nephew, Hollums, to the Little Red River today for his first fly fishing trip. It has been a beautiful holiday weekend but with the water dropping, and almost gin clear, along with bright sunshine the fly fishing was little more difficult. Regardless, after a short casting lesson this new fly fisher hooked up his first Rainbow trout on the second cast with a #14 gray, flash back, sowbug. That fly is now stuck in his favorite fly fishing hat. 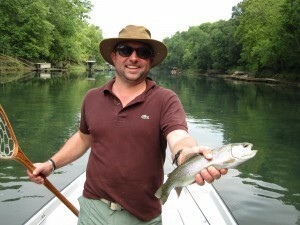 This marked the 13th client this year to catch their first trout on a fly rod in our boat. That is just cool! By the way, as you can see, Stuart did pretty will getting hooked up on some nice Rainbows as well. It was a delightful morning of fly fishing and I bet these guys will back soon.